At JellyBeans, our qualified staff members enjoy working closely with parents and caregivers to provide your child with enjoyable and memorable early childhood experiences. Our centers are staffed with a host of seasoned, compassionate and dedicated pre-school teachers, who enjoy working with children and being apart of their social, physical and educational development. Our child care center environment recognizes and appreciates the inherent strengths of diverse backgrounds and we celebrate and respect cultural differences, individual interests and the personal talents of our children, families and our staff. Our classrooms are appropriately decorated and demonstrate colorful kid-friendly learning environments, that prove to be inviting for children with all intellectual levels, learning styles and interests. We offer a comprehensive curriculum that includes creativity, developmentally appropriate structured and free-form learning and discovery! JellyBeans promotes healthy eating and hygiene practices and a comprehensive physical activities programs that includes organized games and the ever so important -- free play! Our policy is to provide every child with a high quality early childhood experience in a safe, nurturing and developmentally appropriate environment. Our staff views education as a partnership between parents and teachers. We strive to maintain a good rapport with all families based on open communications and mutual respect. We believe in empowering children by offering them experiences to learn at their own pace through decision making and problem solving. By providing an engaging curriculum, it is our aspiration that each child will develop a positive outlook towards school, a lifelong love for learning and a better understanding and appreciation for the world around them. 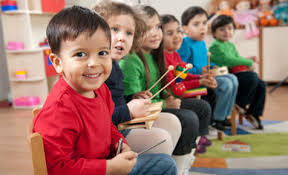 The JellyBeans Child Development Center Program offers our children continuous opportunities for positive social interaction with in a developmentally appropriate environment. We welcome children of all abilities, diversities and cultural and social backgrounds and we encourage all families to enroll their children in our early education program. Our curriculum and lesson plans offer a wide variety of child initiated and teacher directed learning activities that celebrate and reflect the interests of our children from various cultural backgrounds, the child’s primary language and their family traditions and lifestyles.